This broad range of multi display grommet mounts accommodates standard and widescreen displays. They are rigidly bolted down to the work surface providing a rock solid solution. Independent adjustment of each screen for proper ergonomic alignment. This is great for users who commonly work with multiple flat panel displays. Compatible for screens with VESA 75 x 75 mm or 100 x 100 mm compliant mounting patterns. 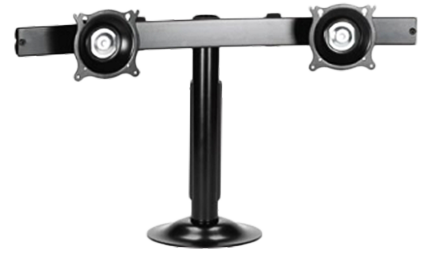 It is also has a heavy-duty, solid steel base and oversize pole for unmatched stability.